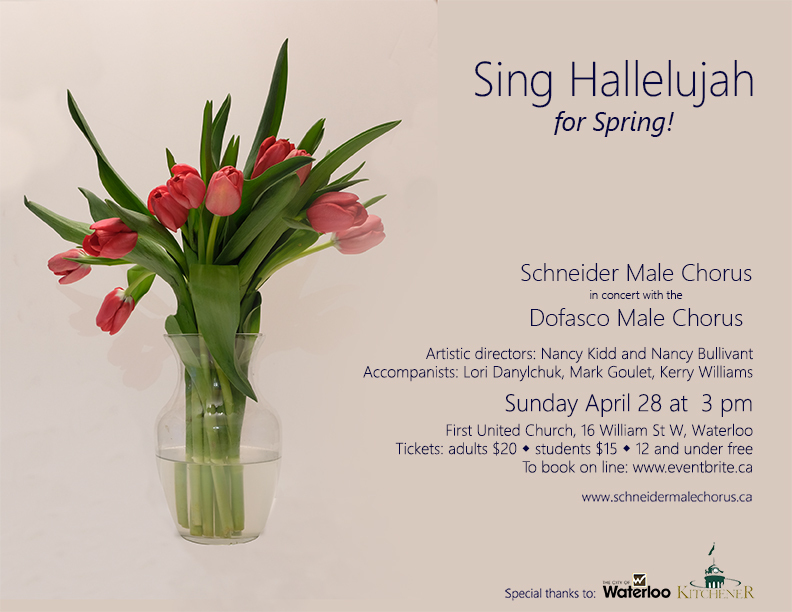 …and so is our spring concert “Sing Hallelujah for spring!” This year our special guests are the Dofasco Male Chorus – a chorus with a similar grand history to ourselves. There will also be a short segment from our quintet group The Quintessentials. 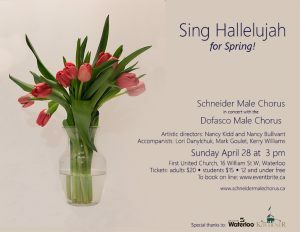 The concert is Sunday April 28 at 3pm at First United Church in Waterloo. You can get tickets here or at the door or from a chorister. The Schneider Male Chorus started its 79th season in September, continuing to fill our audiences with a sense of tranquility and enjoyment. In addition to our planned schedule, we take on other events throughout the season. That’s why there is a special area dedicated strictly to bookings. We encourage you to drop us a line if you would like to engage a professional, well rehearsed, thoughtful and entertaining choral group. We have added a side-group of 5 men who sing as a quintet. Their repertoire is a little more titled towards pop but still runs the full range. They are happy to be available separately or with the main chorus. More information on them can be found at their website – The Quintessentials Quintet. The Schneider Male Chorus would like to thank the City of Kitchener, the City of Waterloo, and anonymous donors for their continued generous support through their grants and donations. We would also like to acknowledge and thank our faithful concert supporters.